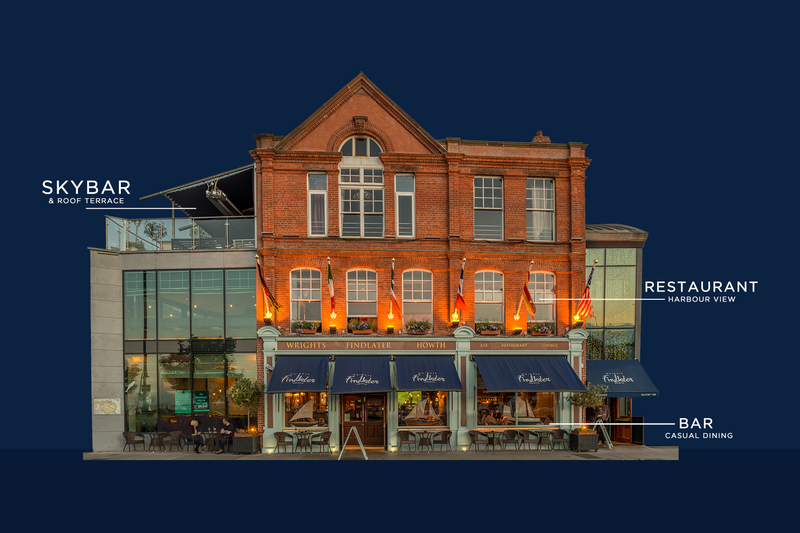 Wrights Findlater Howth is housed in a landmark building with a traditional red brick facade. It’s located opposite the Dart Station in the heart of Howth Village on Dublin’s East Coast. We offer the best views of the harbour with breath-taking views of both Lambay Island and Ireland’s Eye. It’s a unique venue, that offers a cosy bar on the ground floor, a stunning modern restaurant on the first, and a private function room with outdoor heated terrace on the second floor. So whether you join us for a pint, some dinner, or a private function, we guarantee you won’t want to leave. Our restaurant and 2nd floor bar are available for private functions, corporate events and weddings. Talk to our events team about the perfect package we can build for you. At Wrights Findlater Howth, the world really is your oyster.